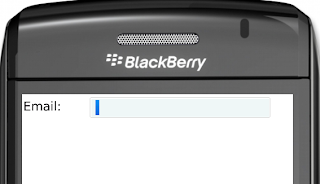 Every java blackberry application developer require EditField in blackberry. Here as following code is use full how to create custom EditField component in blackberry. We can also create same CustomPassword filed please change EditField to PasswordEditField. Hi Suresh, brilliant blog. Got a question for you about the Custom EditFiled. I am just wondering how u manage the moving of the focus. Cause i am experimenting with custom fields. Im following ur model of a manager and using a edit field however i cant seem to scroll backwards with the touch roller when at the end of the string. Have u ever experienced this? PS. When i mean scroll backwards i refer to scrolling back throw the text. Hey, I found out what the problem was lol, basically the loop drawing the text will always draw the same text. Need to check where the cursor is in the string. it gives error because no overloaded method for PasswordEditField takes 1 argument which is style. What I need to do here? Create login screen in blackberry.